At St Mary’s, Religious Education is a core subject. We are a Church of England school and we follow The Diocese of London Board for Schools’ curriculum; learning about Christian beliefs, teachings and values forms all of the teaching in the Foundation Stage (Reception) and two-thirds of the curriculum in Years 1 – 6. The other third in Years 1 – 6 explores other major world religions. We have a close relationship with St Mary’s Church, visiting at Harvest, Christmas, Easter, for the Celebration of Life and at the end of the school year for the Leavers’ Service. Every week, on all sites, Father Piotr leads Collective Worship, furthering our understanding of Christian beliefs. 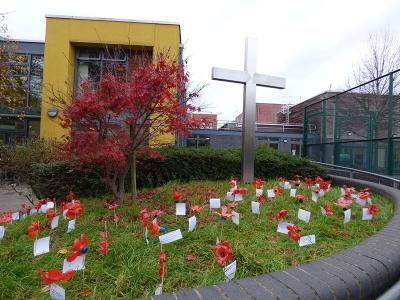 As a school, we have six Christian values which we explore and celebrate across the year: Friendship, Thankfulness, Forgiveness, Wisdom, Service and Endurance. We appreciate and celebrate other religions and beliefs; our pupils learn about Buddhism, Hinduism, Sikhism and Islam – religions which we see practised around us, here in London. Through our religious learning we explore: beliefs and teachings; ways of living; and ways of expressing meaning. Our children not only learn about religion but are also encouraged to learn from religion. Ultimately, we aim to foster compassion, love and understanding for all religions.